Cal Jr is almost a year old now, and will be a year old on April 19th. 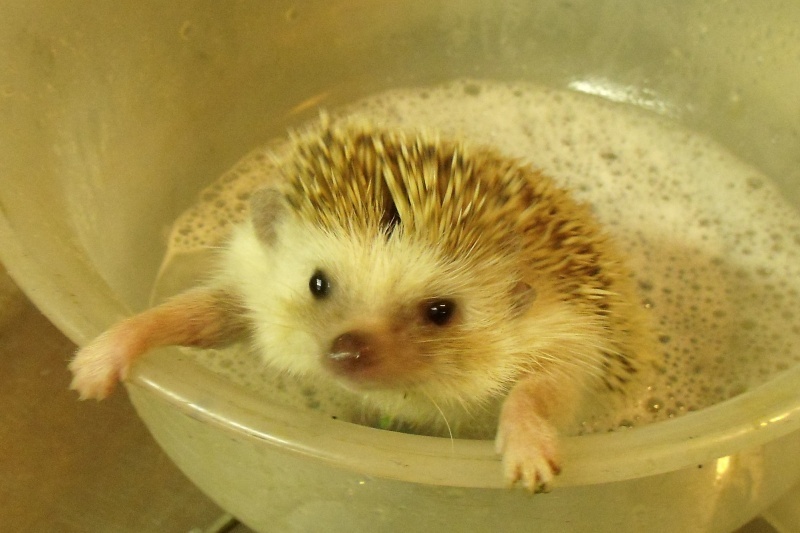 Here's a picture of Cal trying to get out of his bathtub, giving the impression that he's hauling himself out of bath. A second picture shows Cal being cozy on the sofa pillow. Sweet, but has his options on everything and can be a fiesty boy. I'm enjoying him and he travels well to whatever I go. I can put him in a "hedgie" bag and in my bag, and off we go to school or whatever I go. He is absolutely adorable! Great picture! Welcome, 2015 - new beginnings. Hot, hot, hot - just too hot these days. Rain, rain, will it ever go away? Fine jewelry made from gold, silver, gemstones; unique flatware and serving pieces, and whismical metal sculpture. Most silver and gold is recycled, and many vintage compoments are used. Made by hand in New Hampshire since 1984.